The qTranslate-X is a free popular plugin that adds support for multiple languages on a WordPress site. I really like it, but the only issue I have with it is that the default image flags for the Language Menu are not that good. In this article, I will first show you different types of Language Switching Menu we can choose from and the two ways we can display them. Finally, we are going to replace those default images with our own. Website with multilingual functionality needs to give a visitor a way to switch between the languages. With qTranslate-X, this is achieved by displaying the so-called Language Switcher or Language Selector Menu. There are two ways to display the Language Switcher. Using Widgets or by calling a qtranxf_generateLanguageSelectCode($args) function inside a template file. Let’s examine both options. If you want the Language Menu to be displayed in a sidebar, this is the way to go. From “Available Widgets” find “qTranslate Language Chooser” and drag it to the sidebar on the right. If you want the Language Menu to be displayed at the specific location in the template, we need to modify the appropriate template files. For example, to display the Language Menu at the top of the page you would most likely need to edit header.php file. We display the menu by calling the qTranslate-X native qtranxf_generateLanguageSelectCode($args) function. 'format' – only used when 'type' is 'custom'. 'id' – id of widget, used for CSS purposes. No matter which one we use to display the Language Menu, we have different types of menu to choose from. The types are all self-explanatory, except for the ‘custom’ type. Let’s examine it in more detail. With ‘custom’ type, we can specify what to display by using ‘format’ key. Note: When using a widget, we would put the value of 'format' inside "Custom list item format:" field. When none of the types suit our needs, ‘custom’ type can become really handy. Now that we know how to display the Language Menu, let's replace the default flag images with our own. First, we need to give appropriate filenames to our custom flag images and then upload them to the WordPress site. Get the flag images. If you don’t have them yet, there are plenty of sites that offer images and vectors for free. One such site is FlatIcon that has an International Flag Package containing more than 250 flags. Make sure to download them in .PNG format. Rename the flags, so that they match the filenames of the default internal qTranslate-X flags. Go to Dashboard > Settings > Languages and select "Languages" tab. In the Flag dropdown, you can see the flag file name that the qTranslate-X expects. Rename your custom flag to the same filename. Repeat these steps, so all the custom flags will have the correct filename. 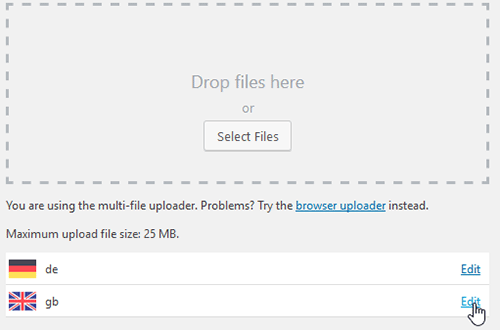 Go to Dashboard > Media > Add new and then drag & drop the image files. Click on Edit link for any of the uploaded flag. Copy the File URL of that image. We need a path to the folder where the flags are stored and will use it in step 3. We only need to do this for single flag, as all other uploaded flags are in the same folder. Next, let’s set the ‘type’ of the Language Switcher to be that of ‘image’. If you are using a qTranslate-X widget, simply select the ‘image only' radiobox and click Save. For qtranxf_generateLanguageSelectCode($args) function, insert the following code where you want the Language Menu to be shown. All that is left is to change the path of the default flag images folder that is used by qTranslate-X plugin. Note: Another way to customize the flags without changing the flag images path is to use 'custom' type and CSS. Quick guide on making changes using CSS is shown later in this tutorial. Inside Flag Image Path field, paste the URL we saved from the step 1, when we uploaded images of our custom flags. 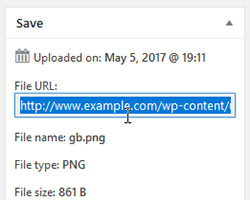 We only need part of this URL that starts after .../wp_content/ and ends before the filename. Click on "Save Changes" button. And we are done. The qTranslate will now look for flag images into the folder that were uploaded to in step 1. If for whatever reason you don't want to change the Flag Image Path for the qTranslate, you can still achieve the same result by using 'custom' type. With this solution, the flags will not be rendered with <img> tags anymore, but will instead make use of CSS background. Then make the necessary CSS changes in the style.css template file. Replace FLAG_URL to the URL of the flag inside the CSS background property for each flag. 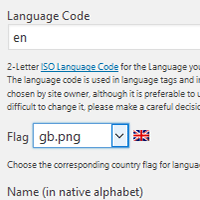 Classes for the language specific flag contain at the end of their name their specific language code (for example .language-chooser-item-en end with en). So make sure to replace the language code with the appropriate language code for each of your language. 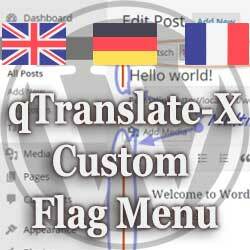 With qTranslate-X WordPress plugin, we can have the website that supports multiple languages. Switching between the languages is achieved with Language Selector or Language Switcher menu. This switcher can be displayed in various ways, one of which is displaying image flags. In this tutorial, we changed the default image flags with the custom ones by changing the Flag Image Path for qTranslate-X Plugin. The tutorial also showed, how to use custom flags by leaving the Flag Image Path alone and changing the CSS styles instead.